This self-produced multimedia story, with all my own text, photos, video and interactive design, ran in The News Tribune in July 2014. It won the 2015 award for Best Completed Research (M.Comm) from the University of Washington Communications department, and second place in the Comprehensive Coverage category for the 2015 Northwest awards from the Society for Professional Journalists. I wrote, shot and edited it myself, laying out the design on Adobe Muse. 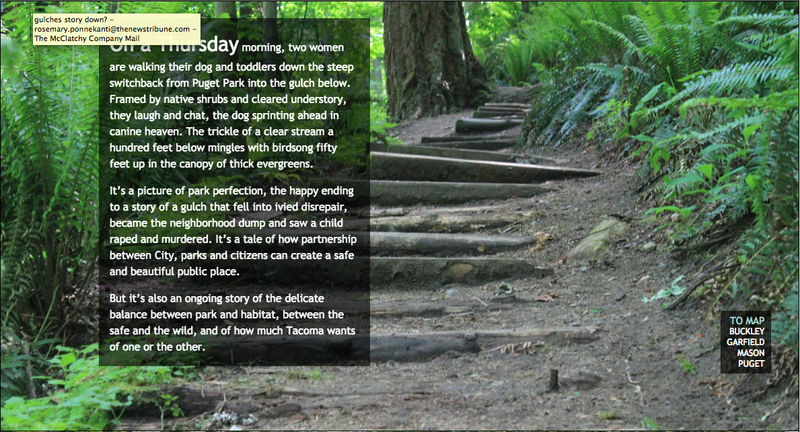 Tags: gulches, journalism, multimedia storytelling, The News Tribune, UW. Bookmark the permalink.